Twelve quid. Twelve flaming quid! That's what it now costs to park at The NEC and represents approximately eleven quid more than it's worth. Even more annoyingly, those of us needing to use the disabled car park are obliged to hobble or scuttle the last 300 metres to the main entrance, while the able-bodied, similarly stung for 12 quid, are given a free bus ride right to the front doors! And some of the exhibitors told me that they, too, have to pay the 12 quid tax, even though their businesses have spent thousands on putting together a stand. If you've three bodies on the stand, that's another 36 quid per day, or over a hundred quid for a three day event such as this year's Traffex bash. This is urine extraction on an industrial scale! I have a simple rule-of-thumb when it comes to events such as Traffex: I scan through the exhibitor list and if there are six 'names' I'd like to speak to, then it's a "maybe-if-I've-nowt-else-to-do"; 10 names and it' a "quite likely"; once we get over a dozen names, it's usually a "definite". Traffex fell just short of the magic number 10, but it was a nice day, and there was one particular exhibitor I really did want to meet, so, completely unaware of the 12 quid sting (on top of the 11 quid it now costs to saunter along the M6 Toll Highway Robbery Scheme) I headed off for Birmingham on Thursday of last week. 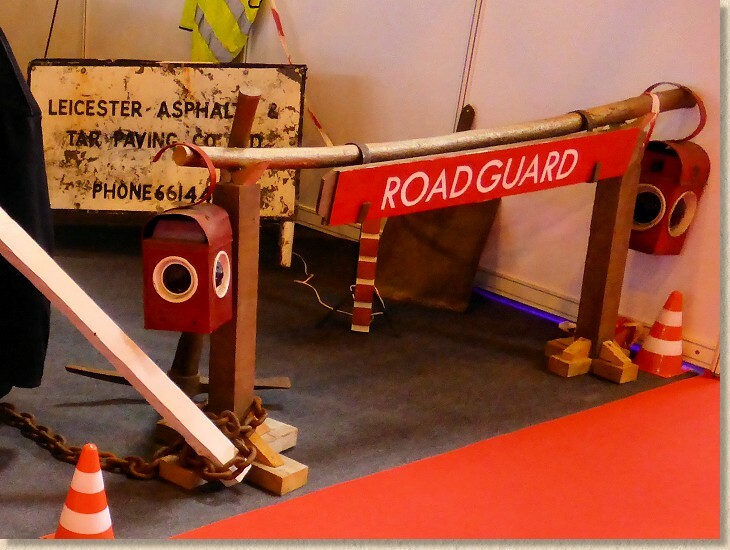 At first glance, there really isn't a lot at Traffex, or its sister event, Parkex, to attract a paving and highways contractor. Indeed, the first part of the hall is given over to the manifold methods of extracting yet more money from harassed motorists, whether it's by means of satellite-controlled parking gizmos, nasty, sneaky speed cameras, underhand radar traps or one of the dozens of other intricate-looking boxes of technology with enough flashing lights to trigger a seizure. If you have any dosh left after filling up the tank, they have ways to get it off you! Anyway, once you've beaten a path through the highwaymen, there are a few stands that are worth closer examination and the display from Jobling Purser was well worth the visit. 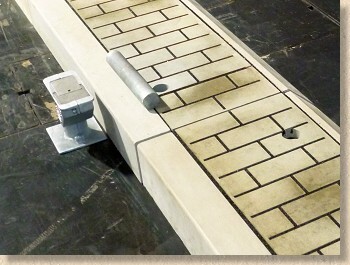 Best known (at least to me) for their wonderful pitch jointing products for setts and other stone paving, the Newcastle-based company have recently been investing heavily in the intriguing Quicksetts™ system, of which I've heard and read much but never actually seen 'in the flesh', as it were. Luckily for me, they had a selection of samples to view and I have to admit that I'm very impressed. Quicksetts sample panel OK, so if you got right up close you'd be able to tell that they are not genuine cropped granite setts, but from standing height, they are damned convincing! And then when you factor in the speed at which they can be installed and opened to traffic, it makes you wonder why they aren't more widely used. Well, that might be about to change. Sales manager Richard Vallance has spent three years building up a carefully considered portfolio of case studies and is now reaping the rewards with a surge in interest from highways departments, facilities managers and property developers the length and breadth of the country, including a very interesting potential project in the Channel Islands. 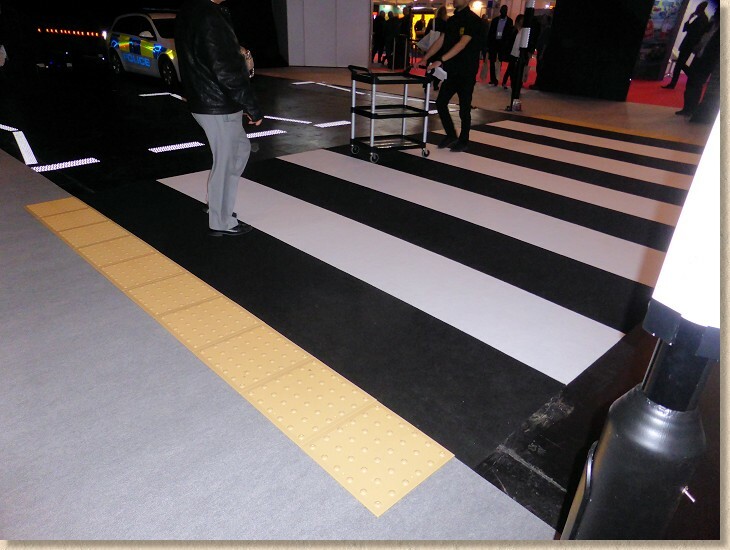 These Quicksetts are such a well-thought out product, from the way that the centre setts on the speed bump panels are raised more than those on the edges, to the fact that setts on the corners of the panels can have a lowered profile to reduce the trip hazard. They are fixed to an existing road surface in minutes using a specially developed polyurethane resin, and come in a wide range of formats: rumble strips, channels, roundabouts and even as individual pieces. And they have HAPAS approval! As an avowed devotee of natural stone sett paving it pains me to admit this, but I can envisage applications where even I could be persuaded to use Quicksetts in place of 'the real thing'. Instarmac had a huge, enormous, gigantic stand: in fact, I think it was two stands, and although I missed them, I believe they were presenting live demos of the ever-growing range of products they offer to the streetworks industry. 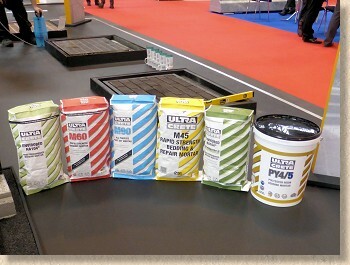 Proprietary bedding and jointing mortars, along with ancillary products such as primers, have become a huge part of our trade over recent years, and with the forthcoming re-vamp of BS 7533, that is only likely to grow even more, so you can understand just why Instarmac felt it necessary to have such a strong presence at this particular event. However, there's a lot more to Instarmac nowadays, everything from ironwork-bedding mortars to pothole repair macadams to tiling grouts. It seems they are ultra-confident about the future of street maintenance and well-placed to cope with all the changes taking place. I was hoping to have more of an in-depth chat with the UltraScape brand manager, but he was detained elsewhere and the promised 'phone call when free never arrived, so a missed opportunity there. 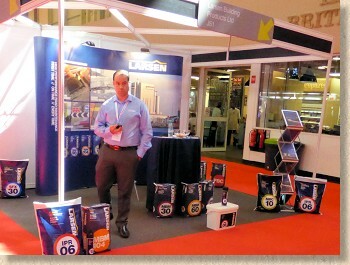 Northern Ireland's Larsen Building Products are also keen to stake a claim in the mortars-for-streetworks market, and have recruited an impressive array of sales reps to help them muscle their way in to the trade on the British mainland. A lot of contractor's I respect have nothing but praise for the Larsen cementitious products, and claim to prefer them to other, possibly better known brands, but the problem has been distribution on this side of the water. London Stone do carry some stock for those contractors working in and around the M25 area, but for those of us in more salubrious parts of the country, ordering in from the Larsen HQ in Belfast has been the only real option….but that may be about to change. A British distributor is being actively sought so maybe later this year??? There did seem to be plenty of companies offering some form of resin surfacing, either resin bonded or resin bound, but none were particularly familiar to me which sort-of suggests they are bandwagon jumpers. It was strange, though, that none of the genuine forces in resin surfacing thought it was worth attending the show as exhibitors. Have they missed a trick? 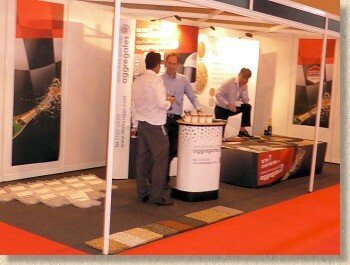 However, two of the biggest suppliers of aggregate to the resin surfacing trade did manage to put in an appearance. 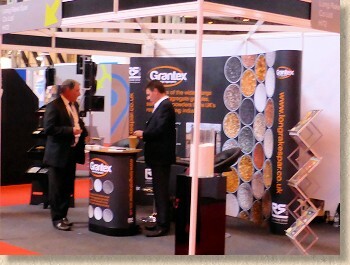 Long Rake Spar were heavily pushing their Grantex range of dried aggregates, along with a selection of anti-skid products, while near neighbour, both in the hall and in reality, Derbyshire Aggregates had something similar, but fleshed out with products aimed more at decorative landscaping. It struck me that both companies rather rely on third parties to offer some way of sticking their aggregates to a surface, so just who were they targeting at a show like this? Shimpac were showing an idea almost as old as road construction: the use of pre-formed spacers to pack-up ironwork in the carriageway. In the bad old days, bits of almost anything – roofing slate, broken flags, scalpings, plasterboard, even timber(!!!) – were all too often used when setting the levels for ironwork, but things are different now, and there is a growing market for stable, inert 'shims' to enable fine-tuning of manhole covers and the like. As I said, it's an idea that's been around for a long while, and more than few "inventors" bring such ideas to this website each year, but the problem has always been cost. Is there enough money in highways nowadays to justify pre-fabricated packs, and is there the will amongst contractors? It's still all-too-easy to rely on bits of tile and then daub over them with mortar before the engineer spots what's been done. 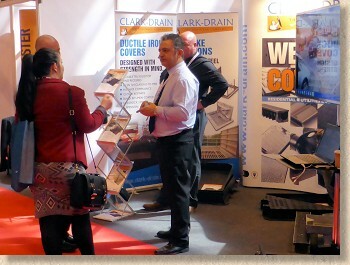 Talking of ironwork, Clark-Drain used to be such a chatty company, but I've heard nowt from them for over a couple of years and looking at the faces on their stand, I didn't recognise a single one, so maybe there have been staff changes. As always, their willingness to innovate is obvious - they have tweaks and twists to access covers that you just couldn't imagine without the aid of hallucogenic drugs - and it's good to see them back on the stump. And if we are considering familiar faces, is it technically legal to stage a show with any sort of connection to hard-landscaping without industry behemoth, Marshalls, being featured? A subdued presentation at this event, focussing primarily on their ever-expanding range of kerb-drain units, although there was an oddly isolated feature on permeable block paving which had a couple of wheels endless circling (and marking!) 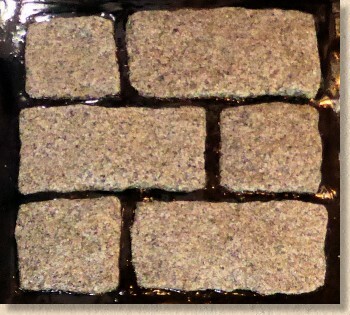 a patch of reduced-chamfer blocks. Kerb-Drains from Marshalls I have to say the range of kerb-drain-kerbs they now offer is genuinely amazing to someone who remembers the launch of the first 'Beany Block' and I've made a note to write something more about this increasingly-used option for the main website, particularly about the need for regular maintenance if they are to give the sort of performance and service life of which they are eminently capable. Too many local authorities seem to think that once that surface water is out of sight, they needn't worry about it any further – are you listening, Warrington? Yes, I *am* thinking about Common Lane in Culcheth, site of many a flood over recent years. A quick mention for the sort of quirky product that regularly appears at shows such as this, promising much, but when exposed to the harsh reality of a pavement engineer's eye, rapidly sinks back into a deserved oblivion. 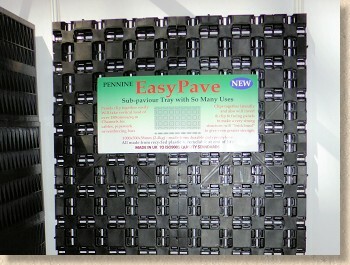 This one is a 50mm deep plastic panel which claims to be a sub-base replacement. The poor sod lumbered with explaining it to me simply couldn't. Explain, that is. She had obviously been told by her superiors that the panel could be laid directly onto the ground and paving laid over it with no need for a sub-base. She didn't know how it would cope with the ups-and-downs of unprepared ground, not how it would prevent bedding falling through the 50mm wide holes. This is NOT a storm-cell type attenuation sub-base replacement system, such as the Permavoid yoke, but a simple plastic panel with chequerboard-like big holes. Maybe you could plonk a shed or a kennel on it, but it most definitely is not a sub-base replacement! Sub-base? I don't think so! Tucked away at the back of the hall was a strange, somewhat desolate attempt to re-create a street environment which could be used to showcase all sorts of highways and traffic nonsense, whilst simultaneously offering an open space for butty-eating and coffee-drinking. 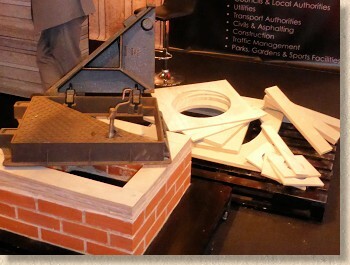 This is an idea that worked really well at EcoBuild-Streetscape some years ago, but here at the NEC, is felt wasted. Maybe it was too big, covering at least 600 square metres, or maybe there just weren't enough products to fill it, or maybe there weren't enough misguided fools willing to spurge umpteen quid on what the NEC euphemistically refers to as 'on-site catering' and so take the opportunity to nosey around the bollards, ped crossings, speed bumps and cycle lanes. I almost didn't bother meself, but someone had told me to take a closer look at the removable cycle lane demarcation units (there must be an easier name for them!). Oh look! 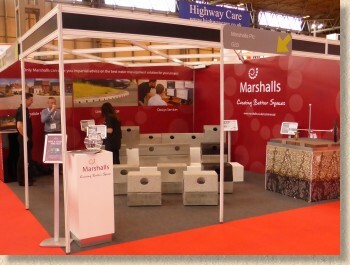 It's Marshalls again, and what a cracking idea! To be fair, the young lady doing the presentation didn't have a bloody clue who I was, or why any allegedly sane person would write about paving, but she did make a decent fist of explaining the concept, which is essentially using special chunky steel studs or pins to fasten raised islands to an existing road surface. The Cycle Segregation Unit The examples shown were specifically designed to section off cycle lanes, so had a half-battered profile on one side and a a gentler chamfered profile on the bike side, and two flavours being shown: the smooth and sleek M-Tech concrete and the much more attractive granite-like 'Conservation' styling. As with all great ideas, you can see how this could be developed and adapted to so many other uses, not just for removing pesky cycle lanes when a town or city wants to stage a Grand Prix or a St. Paddy's Day Parade, but re-organising bus lanes, temporary pedestrian priority and so many other potential uses. Very clever! Finally, a mention for a fascinating display of old tools that were once used when pitch jointing pavements. 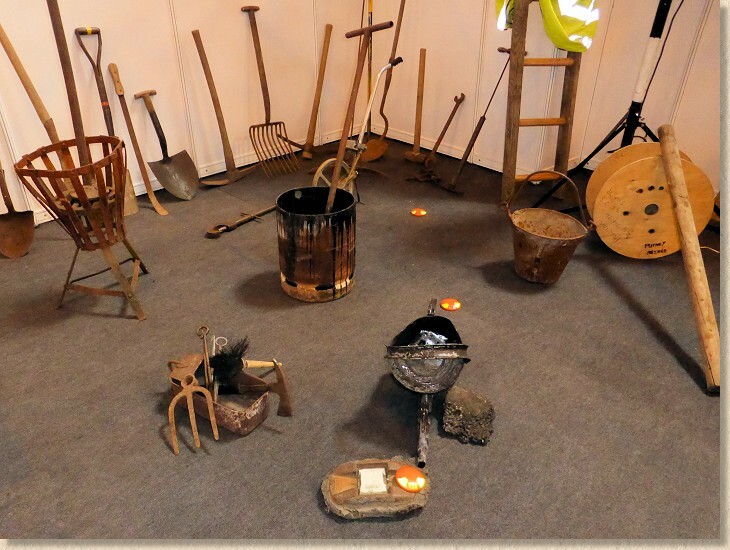 Tar buckets, slicers, burners, tamps, braziers, axes, and a great collection of the old paraffin lamps I had to light with a match each evening as a 7 year old lad helping out his dad on roadworks jobs. So evocative, so many memories of happier, simpler (albeit more dangerous) times when the smell of pitch, richly mixed with the sweet aroma of Park Drive and Condor pipe 'baccy, pervaded your hair and your clothes for weeks. All being shown with the aid of Bolton's Pure Asphalt to raise money for Hearing Dogs, and as much as I dislike dogs, I was more than happy to put a few bob in the jar just as a thank you for bringing back such wonderful memories. So: was it worth it? Well, the twelve quid still rankles (can you tell?) and that will be a heavily weighted factor when considering whether to attend further events at The NEC, but putting that to one side, it wasn't a bad way to spend a couple of hours. Not enough on show to warrant time off site for a busy contractor or project engineer, and this is something the organisers will have to address if they want Traffex to have a future. Just having the bean counters, safety managers and landscape designers fantasising about how they can squeeze another few quid from road users is no route to long term success. There needs to be far more content that's relevant to those of us that actually build the highways and by-ways.